Thunderstorm, hailstorm, gusty winds and cloudy skies were order of the first four days of the week in North and East Rajasthan. Bali was target of the rain for a day also. Bali weather for the first three days was sunny and hot during the daytime. On Wednesday cold winds started blowing from SSE at 28 km/hr. Sky was covered with nimbus and cumulus clouds on Wednesday. At around four in evening it rained in Bali. It also rained on Friday night. The highest temperature recorded was at 33°C and lowest at 16°C. The wind blew from SE at 13 km/hr while humidity was at 24%. Mr. Dhramendra Kumar from M. R.D Welfare Society visited the School and delivered a speech to make the students aware of Cancer. They even informed the students about their Cancer Awareness Program and asked the students to help in contributing funds which would be used for the treatment of those Cancer Patients who could not afford the expensive treatment. Students of Class IV-IX and XI were given sponsor forms to fill in their contributions. Very happy to inform that with the help of family members, relatives and friends, students were able to raise funds up to Rs. 33,098. Thanks to all the students and all those who helped in this contribution. Science is important in our everyday’s life because in every second we does some work and in every work some science is there. If we throw stone in the sky then stone will come down and some science is there .Every person feels the effect of science in every sphere of life.It is not merely the electric light or the electric fan, the radio or the cinema that displace the power of science in our daily life, but everything we do or is done to us is in some way or another connected with science. It is, indeed, true that science has added tremendously to the comforts and conveniences of mankind. Unless one is an ascetic, one has no reason to reject the things science fears. .By conquering time and distance science has brought mankind together and so far made life richer. By inventing medicines it has made our day –to-day existence relatively free from disease, and has, indeed, added to our length of life. It cannot be denied that there is some truth in the above criticism. But we cannot now go back to the old days. We should have all the comforts and conveniences, and we should try to improve upon them. But we must try to be master of scientific appliance, if we can do so science will make are lives richer and in conquering nature man will also ennoble himself. Science is a blessing. Science has given legs to lame and eyes to blind. X-ray is a window through which we can see inside the body. X-ray has done much in finding out many diseases. Vaccination has almost rooted out small-pox, cholera etc. Plastic surgery is latest development in surgery. Now germs die, men live. Today man can live longer and healthier life. Science had conquered time and space. Now man flies in the sky a bird and swims in ocean like a fish ships, airplanes, trains and motors have been invented. Electricity is another wonder. In the field of industry machines are very important. Cinemas, radio, transistors and television give us recreation. Computer and robots are wonder. Man has reached the moon. Science has given birth to many evils. It has invented various war weapons. Atom and hydrogen bombs, rockets, missiles are the example. Science has shaken our faith in god and religion. Science has given us wealth but no happiness. Science is a magic. Which is a non-metal that remains liquid at room temperature? Which non-metal is used in pencil? Which is the gas usually filled in electric bulb is? What is the scientific name for washing soda? The average salinity of sea water is________. The element common to all acid is_________. Which gas does soda water contains? From which minerals is radium obtained? Which is the lightest metal? Wine is sold in tinted bottles because wine spoils when expose to light. By age 65, an American would have watched the equivalent of 9 years uninterrupted TV, viewing more than 20,000 TV commercial per year. The gorilla weighs at least 3 or 4 times as much as a human being, but the human brain is at least 10 times larger than a gorilla’s. The monkey has 2 brains, one to control its body and the other to control its tail. Carrots have zero fat content. Pure gold is so soft that it can be moulded by hand. An ounce of it can be stretched into a fifty-mile long wire. A matchbox-size quantity of pure gold can be flattened to the size of a tennis court. Intelligent people have more zinc and copper in their hair. That is why they turn bald or grey much faster than those with average intelligence. Tuesday, 1st March: The birthdays of the students from Nursery to Class V that fell in the month of January and February was celebrated in the Main School Campus. Students partied by cutting the cake, dancing and distributing chocolates. Mr. Byju Joseph/HOD Science Dept. 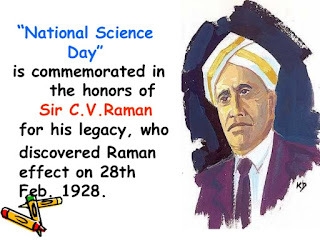 Monday, 29th February: National Science Day was observed in the school. Mr. Byju Joseph/HOD Science Dept. explained why the day is celebrated as Science Day. 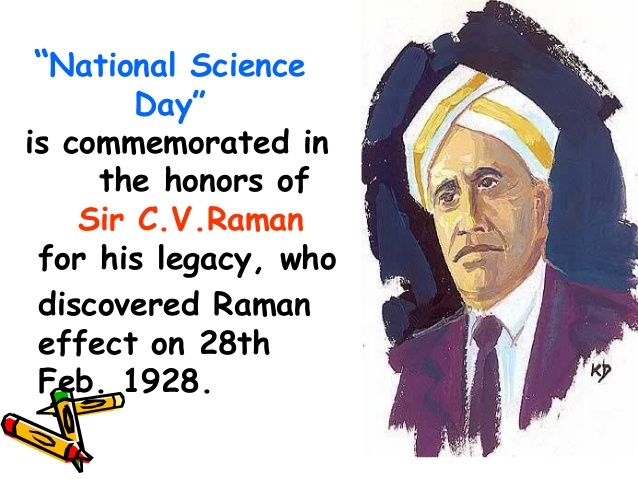 Then he informed that National Science Day is commemorated in the honours of Sir C.V.Raman for hir legacy, who discovered Raman effect on 28th February, 1928. He is the first Indian to get the Nobel Prize for science. So, from February 28, 1987 National Science Day is celebrated in India.’ The theme of the Science Day was Science for Nation Building. Students delivered speeches, articles, facts and recited poem in the Assembly. Kirti Malviya/IX/DH: Recited poem on ‘Solids, Liquids’. Blessy Maria/XI/DH: Gave Speech on Sir C.V.Raman & his works. Vijay Bhati/VIII A/GH: Delivered speech on ‘Science is a blessing’. Avinash Sain/VIII A/RH: Shared facts about Science. Chanchal Choudhary/IX/RH: Gave information on ‘National Science Day’. Dhruv Ojha/VIII A/RH: Spoke about Sir C.V.Raman. Mateen Tak/VIII A/ /RH: Quizzed the Assembly. Rakesh Suthar/VIII A/TH: Spoke on Albert Einstein. Archana Koratkar/VI B/GH: Spoke on Sir C.V Raman. Ipshita Rathore/VI A/RH: Gave information about Noble Prize Winners in Science. Tuesday, 1st March: Class XII Board Exams started that day. They came to School to take blessings of Principal and Staff. After that they went to K.S. Lodha School, Falna to give their exams which is the centre of Board Exams for CBSE Schools of Bali Tehsil. Class X Board Exams started on 2nd March. Best of Luck to Class XII and X students for their remaining papers.